All students are capable of thinking deeply about a text. But that doesn't mean it's easy. And often it doesn't come naturally. Sometimes it feels like if you can just unlock the right door for them, students will get to that deeper level of understanding that you push them towards, or to that opinion supported by text evidence, or to that thoughtful, critical view of an article. While I certainly don't think there is a "magic formula," I do know some things we can do and say as teachers to help. I have seven easy ways for you to get kids thinking deeper about what they are reading. These techniques have helped me push students past the surface, past the obvious, past what they are used to, past what they are comfortable doing. 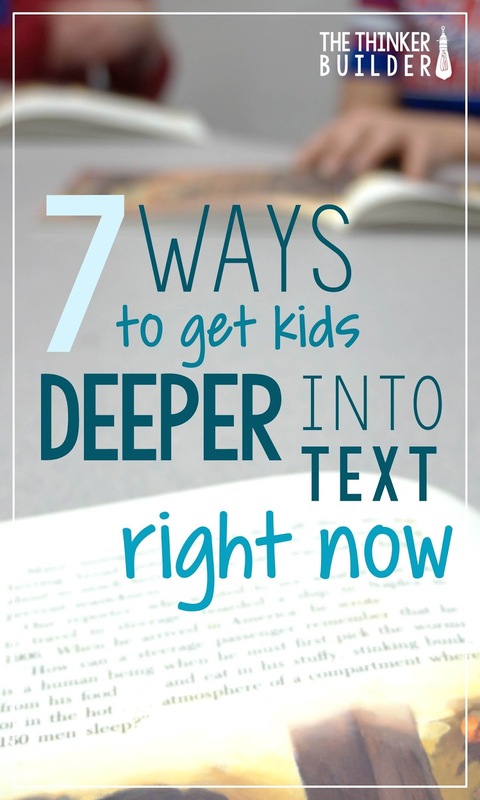 If you can get students to feel something, you can get them deeper into text. Try posing questions that put students into a character's shoes, to feel what the character feels. This can help them better understand the character's actions, reactions, and motivations. Wow, boys and girls. Can you imagine if that happened to you? It's no wonder why this character is so unforgiving and stubborn. Do you think you'd be able to move on with your life? Wouldn't you just want to scream? Try provoking certain emotions. If you can rile 'em up a bit, students want to do more, think more, and figure things out. When was the last time you were down in the dumps? If the author can write something this sad, do you think she experienced that kind of sadness herself? Take those surface-level text-to-self connections farther. Does it surprise you that this character would do that to him? When's the last time someone showed kindness like that to you? How did it make you feel? Did you deserve it? Did this character deserve it? Did it change your day? Did it change... you? Silence can be powerful when reading and working with a text. But I'm not talking about the silence of quiet reading. I mean pausing the reader (whether it's you or them) and pausing the talking. For example, maybe you are reading a portion of a mentor text. Try pausing at an important moment in the story, or at an important point made in an article. Before even asking a question, give students time to process and think about what you just read. Let that sink in for a minute, boys an girls. 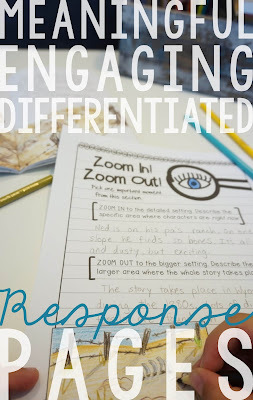 Lean forward, look students in the eyes, show them that you expect them to be actively thinking. When you do ask the class a question, be sure to provide even more wait time. So what are you thinking right now? ...wait... ...wait... ...wait... Now turn to someone and share your thinking (or) write it in your notebook. A nice long pause isn't only for a whole group setting. Maybe you are in a one-to-one reading conference. The student is reading aloud to you, and like many students do, he is trying to sound really fluent for his teacher, which can really get in the way of thinking about the text. Try gently tapping his book. Hang on a second, bud. Let's pause for a moment and think about what's going on. ...wait... ...wait... ...wait... Can you give me the gist of what you just read? Encourage students to take a risk in their thinking. Get them unstuck from simply trying to figure out what their teacher wants them to say. In order to do this, you need to be careful with the questions you pose. Asking leading questions doesn't give students much room to think for themselves: Don't you think this part was really exciting? Instead, pose questions in a way that shows you truly want to know what your students think. Do you think this part was exciting? Do you really? Use your body language and voice inflection to help encourage students to be honest with you. Something else to try is to ask a question that might seem like a leading question, and just when students start to all agree, throw them a curve ball with your own alternate, dissenting opinion. Don't you think this part was exciting? ...wait... ...wait... (cue zombies nodding heads). Well I don't. I don't think it was exciting at all. I mean, I expected those things to happen, so how is that exciting? It was informative, but not exciting. The author didn't even tell us what the character was thinking and feeling. Your blunt, unexpected words will probably shock students. Some will jump ship and join you. And some might drum up the courage to disagree with you. Show students that it's okay to think differently by doing it yourself. A way to ease into risk-taking is to ask students to make predictions about text. Help them see the importance of grounding their ideas in the text, and encourage them to elaborate and explain their predictions with detail. Also be careful with how you respond to students. Always praising students for answering "correctly" shuts down alternative ideas. Instead, praise the risk itself. Did you guys notice what Sam just did there? He shared a thought that was different than most of you. But he explained why he was thinking it, and that takes some guts. It's pretty normal for only a few students to be the ones that consistently participate in sharing their thinking, and if you aren't careful, many of the other students fade effortlessly into the background, content to nod their head, scrunch their eyebrows from time to time, and avoid eye contact. Alternative ways to respond can counteract this problem. Rather than a whole class discussion, have students discuss their thinking with a neighbor or small group first. Or have them show their thinking through writing, drawing, or a graphic organizer. Or boil a question down to a few possible responses, and then ask everyone to show their opinion somehow. Give me a thumbs-up or a thumbs-down to show whether you think the author gave us enough detail about a bear's teeth. (or) If you think the most important event from this chapter is , go stand in that corner of the room, if you think it's , go stand in that corner, and if you think it's , go stand in that corner. Be on the lookout for wishy-washy answers, especially from your higher readers. Maybe you see someone showing you a thumb sideways to your question, or maybe someone trying to stand in the middle of the room because they agree with two different answers. Urge students to make a choice, even if they change their thinking later. If you allow them too often to sit on the fence, students tend to just follow someone else's lead. As students grow more comfortable with thinking a lot about a text and fine-tuning their own ideas about it, expand their perspective. Guide them to look at an issue or idea from different points-of-view. Have them analyze the choices made by a character or an author and the alternatives that were not chosen. One of my favorite ways to widen students' perspective is with a "what if" question. Asking students a question that starts with "what if" is like adding forks in the road that students may otherwise never notice and consider. What if this character had to act alone instead of with her friend? Do you think she would have followed through? Would it have gone differently? What if this character had a flashlight with him? Would that make it easier for him? Would it have made the story better? What if the author changed the order of these sections? Is there a different way to organize this chapter that might be clearer? What if the story ended right here? Would you be satisfied? What else is truly needed? Sometimes a "what if" scenario you suggest might get dismissed by a risk-taking student. "Mr. F., it would never happen that way, because..." Encourage that too! Considering other options, and making decisions about what's plausible, what's important, what's necessary... that's thinking deeply. Reading a text, or a portion of it, a second time is not wasteful. It's an investment. During a first reading, students are trying to follow the story or grasp new learning. Once students have a basic understanding of the text, reading it again opens up new doors to thinking about it in different ways, focusing on word choice, structure, themes, and underlying messages. One of my favorite ways to use a second reading is with a short text that contains a surprise ending or big twist. Mysteries are perfect, or pretty much any Chris Van Allsburg book. After students read the story to its conclusion the first time, we can then look at the story again with an entirely new perspective. Characters' motivations and actions take on new meaning since we know what's eventually going to happen. Small details we ignored during the first reading now take on great significance. During whole-class read alouds, try incorporating a "mini" second reading right there during the first reading. Maybe you are reading from a novel and you just hit upon an important sentence. Did you hear that, boys and girls? Here, let me read that part one more time. Often students get so caught up in a good story that it takes a second reading to shine a spotlight on the nuances and craft. Modeling your own thinking is so important. Young readers need to hear how and what experienced readers do inside their minds. Be detailed. Be sure to model not only your thinking about the text, but also stop to point out important parts and steps of your thinking. Did you see what I did there, boys and girls? I said what I thought the author meant by that sentence, but I didn't stop there. Then I tried to think back to the story for other pieces that support my idea. Try shaping your modeled thinking into the form of a personal story. Students love hearing about their teacher's life. So boys and girls, I was reading the newspaper last night, and I came across this headline that really caught my attention: "Wild Coyote Chokes On Wild Artichokes." And it got me thinking. I thought, Hmm. Why did I want to read this article so much? I don't even like artichokes. Did the title make a difference? I think it did. I liked the little playfulness in the words, using "wild" twice, and "chokes" twice. And it also made me think about the coyote. I wanted to know if it survived. Do you see how a title is an important part of an article? 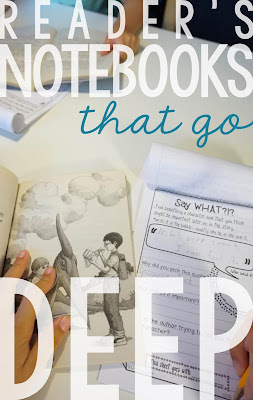 If you are in need of resources that foster and support deeper thinking about text, you might be interested in my Reader's Notebook Response Pages resources, shown below. Click the images for details. 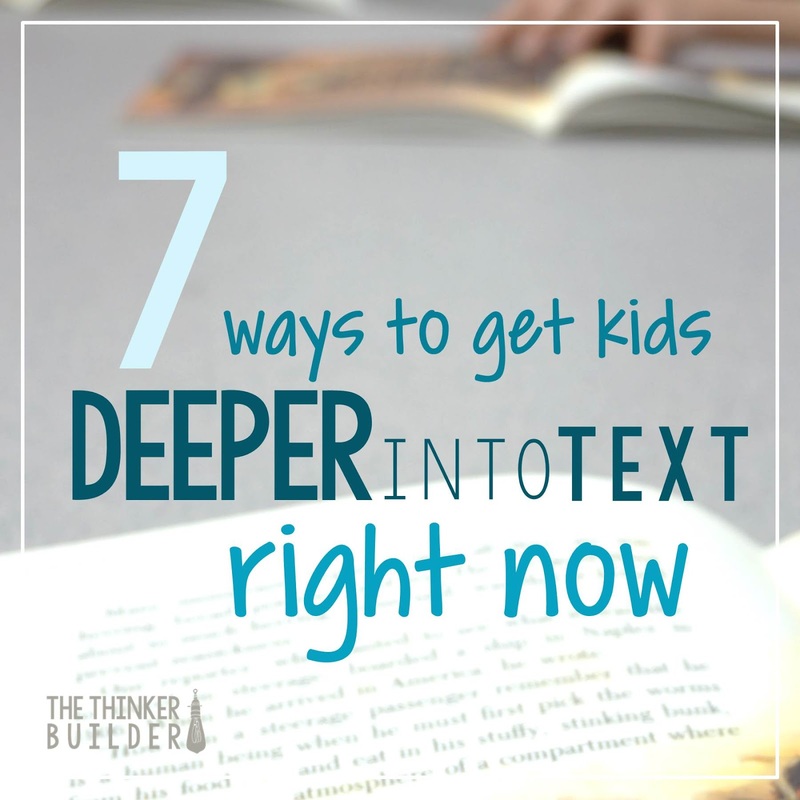 How else do you help students dig deeper into their reading?